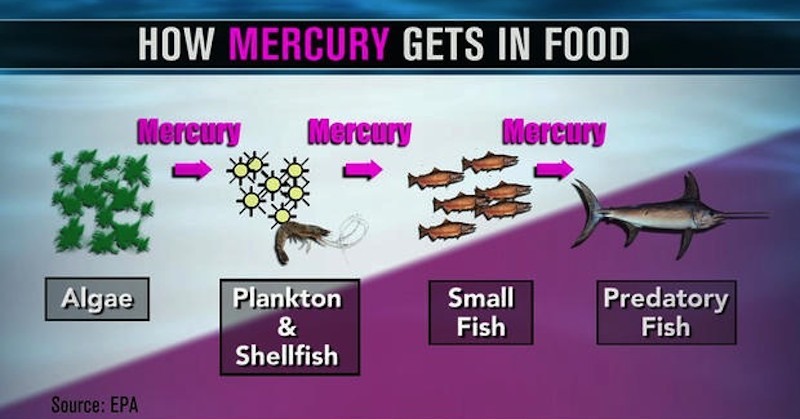 Mercury-Contaminated Fish That You Must Stop Eating - Which Are Safe? Mercury is an element (Hg on the periodic table) that is naturally found in our environment in the air, water, rocks and soil. Mercury can be found in several different forms: metallic mercury, inorganic mercury compounds, and organic mercury compounds. Metallic mercury is also known as elemental mercury. At room temperature, this form of mercury is a dazzling silver liquid. When heat is applied, metallic mercury becomes an odorless, invisible gas. Mercury naturally occurs in our environment, but much more of it would be trapped in rocks beneath the surface if not for industrial processes. Coal fired electricity generation, burning fossil fuels such as oil and natural gas, smelting, mining, and incineration of waste are the main contributors of mercury to the environment. These coal power plants account for over half of the mercury that ends up in our seafood. Mercury used to manufacture light bulbs, switches and thermometers also pollutes due to poor adherence with safe disposal. Mercury is spread throughout the air by burning coal and falls onto the ground and bodies of water usually by way of rain and snow. Several species of soil dwelling anaerobic bacteria that take up sulfate convert inorganic mercury to methylmercury through their metabolic processes. This conversion is problematic from an ecological point of view, because methylmercury is more toxic and it takes much longer for organisms to eliminate it from their systems. Bacteria that contain methylmercury either excrete the mercury into water or organisms higher up the food chain consume the mercury-laden bacteria. Methylmercury then travels the waterways to the ocean. Methylmercury in water travels up the food chain from being absorbed by phytoplankton. Phytoplankton is then eaten by zooplankton, small fish then eat zooplankton, and small fish get eaten by larger marine life and so on. Methylmercury accumulates in organisms faster than they can eliminate it. Animals consume and retain higher amounts of mercury each step up the food chain. This is why methylmercury is found in the highest amounts in large predatory fish such as tuna. This mercury biomagnification is most problematic for fish-eating wildlife such as dolphins and some whales and certainly poses a problem for us. This is how Scientific American and their article How Does Mercury Get Into Fish rank the severity of mercury contamination in fish. You can eat from this group, but sparingly. Always practice caution and ensure that you also eat foods that chelate heavy metals. Phew!! So what does that leave you? Very few choices, unfortunately. 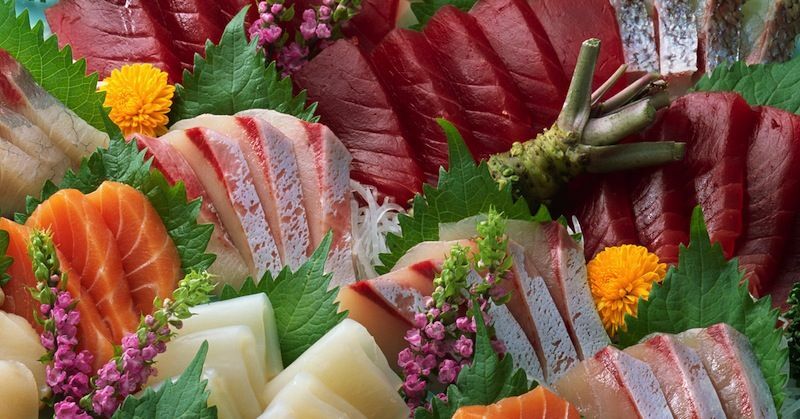 We recommend consuming a variety of fish that have lower contamination levels: Wild-caught Alaskan salmon, Pacific sardines, Atlantic mackerel, Albacore tuna, Sablefish/black cod from Alaska and Canadian Pacific. Always make sure any seafood you consume are sustainably caught, not farm raised, and fresh (not “fishy” smelling). Always opt for wild-caught, rather than farm-raised. Include foods in your diet that naturally chelate heavy metals like cilantro, garlic, onions, brazil nuts, chlorella, and spirulina.